With the right tools and procedures, maintaining your deck can bring rewarding results. Although many decks become discolored and weathered within a few short years - many owners simply learn to live with & accept this, forgetting about what their structure once was. Or else, deciding on a yearly or so cleaning. But with a little extra effort many decks can be revitalized for enhanced enjoyment and chances at a longer life. Possibly preventing future rotting. Upkeep may also relate to not only the types of sealers being used but the kinds of products that makeup of the deck. Not to mention, the influence of initial design and construction. For example, the right sized slat gaps enhance air circulation and cleanliness, as opposed to those set too near, and therefore maintenance issues become affected. Screws that last, and not rust, or decompose, regardless of the chemicals used in the wood pressure treating process - can translate to saving entire board replacements, or drilling yet more holes out. Notably certain screws have had premature failures, so be sure to know what is being used on your structure. Efforts at maintenance should be considered at every phase, from design and construction to throughout the years the deck stands while taking all elements into account like your given part of the country, wood species, hardware performance, types of tools/appliers and products used, etc. Offers details on costs for making repairs like for screws and attachments, to the deck slats and areas of the stairs and handrails as well as for structural concerns and footings. Takes a look at prices for constructing the deck by contractors and when doing yourself. Gives breakdowns for staining providing square footage estimates. Our step-by-step gives the tools and supplies needed and the process for getting great results. 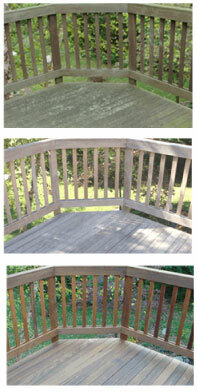 Cleaning Deck Details - the finer points for the more inaccessible spots. Includes brushing techniques and unsuspected ways of detailing the deck out. Find out how applying sealer brings tough-to-beat results. Specific application methods for natural wood decking. Deck Sealing Details - How to use specific tools for applying sealer onto hard to reach places, masking efforts and areas of concentration. One of the most frequent concerns and with so many products on the market, we cover the process and choices.